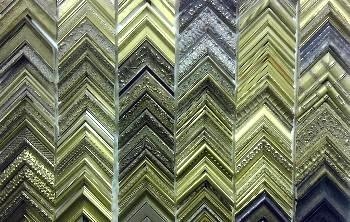 The Frame Shop & Gallery has been providing the Hanover area with quality custom framing and superior service since the early 1980's. We have been a locally owned and operated business located in the downtown Hanover area from our beginnings in the old Shirk's Hardware building. Here at The Frame Shop, we do things the old fashioned way. We join each corner in a vise using high quality glue and tap each nail in by hand. We believe in fine craftsmanship and things that will last a lifetime. Whether it is your grandmother's Christening gown or your child's finger painting, you can rest assured that you have found the right framer. 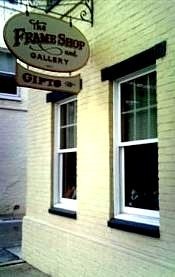 Recently The Frame Shop has been converted into a fine art gallery featuring the work of talented artists from the Hanover area and it's surroundings. Our artists' works include original water color, acrylic on canvas, charcoal on paper, acrylic on paper, scratchboard art, and original photography. We also carry beautiful art jewelry, mobiles and pottery. 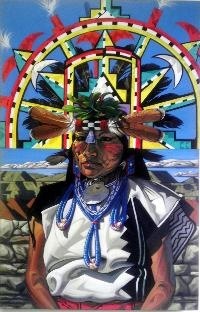 Above, an original acrylic on canvas by local artist Eric Sheaffer.